The much anticipated Intersoft Studio 2015 is now released. The wait is over! Today we just released Premier Studio 2015, our biggest release ever. 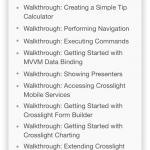 You will discover a lot of new features and enhancements, especially on our cross-platform mobile toolset, Crosslight 4. 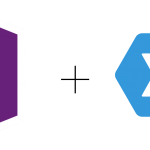 Our team has put big efforts on bringing WebUI Studio to fully support of the newest built-in Microsoft Edge web browser and Microsoft Visual Studio 2015. You can now enjoy utilizing our controls in these latest technologies. Let’s see some of the key highlights in this release. Crosslight 4: The Gold Standard for Enterprise Mobile Development Toolset is Here. We have committed to provide the best and powerful features to Crosslight from version 1 until now. In this release, Crosslight 4 introduces more than 12,000 new APIs, three times more than the previous release. This release also adds a comprehensive data visualization suite supporting 20+ chart types, supercharged sync framework, view projection technology, barcode scanner service, a highly extensible logging framework featuring integration with Azure Application Insights, all-new dialog presenter, as well as hundreds of major improvements in data access components and synchronization framework. 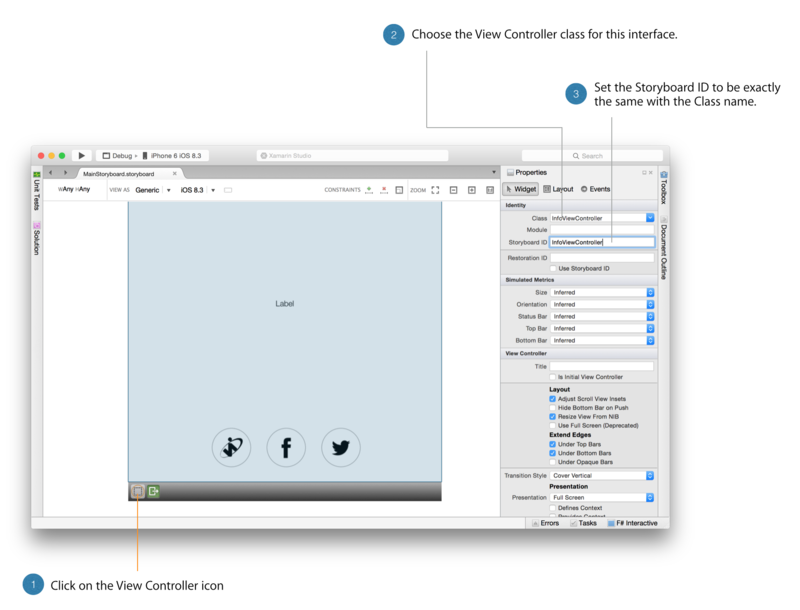 Moreover, we also provide iOS storyboard support and many tooling support improvements, allowing you to design iOS views and work with Crosslight iOS components entirely in Xamarin Studio, whether in Mac or Windows. Discover more about Crosslight 4. You want it, we deliver them to you! As Enterprise mobile user, you will obviously need to process the data into meaningful information on the go. We are here to present Crosslight Charting which takes mobile charting to a whole new level. With over more than 20 chart types, you can freely visualize data on mobile devices like never before. You will love the key features introduce in Crosslight Charting. We have lighting-fast performance with pixel-perfect rendering, smooth animation with elegant styles, interactive axis zooming and panning, built-in enterprise chart features and more. Let’s see what Crosslight Charting offers. Since the initial version of Crosslight, Crosslight provides a way for you to easily display messages or user actions with a centralized call of the presenters from the ViewModel. You can freely choose from either one of the following presenters: Action Presenter, Activity Presenter, Message Presenter and Toast Presenter. It doesn’t stop here as we have added all new, very powerful and flexible presenter to the family: the dialog presenter. Using the dialog presenter, you can display virtually any content using the dialog presenter, complete with your own app branding. 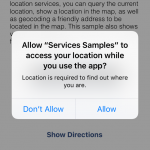 This takes out the pain from developers to display flexible content inside their apps. Learn more. 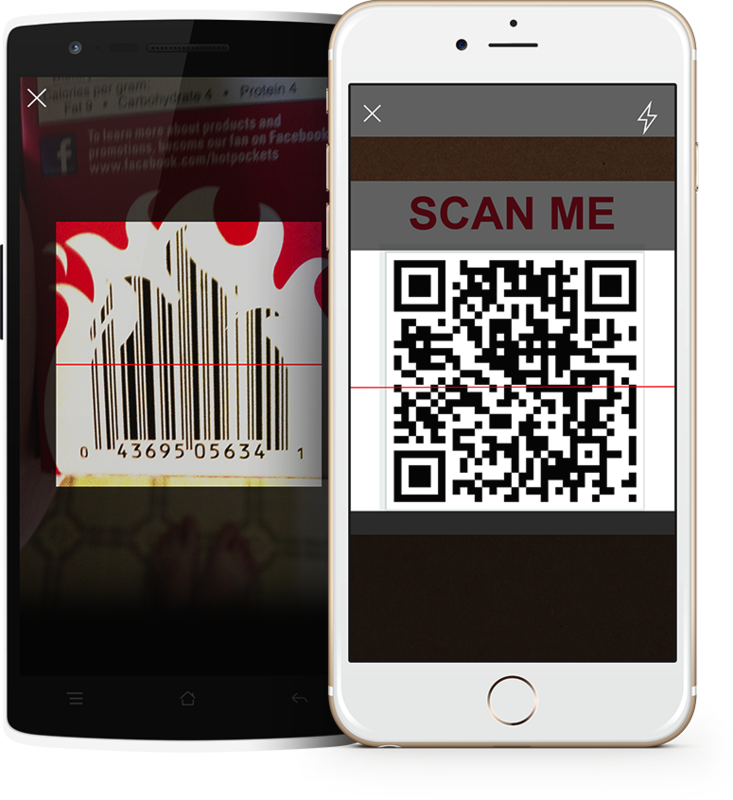 Never thought how you can create barcode scanner on your mobile devices? In this release, Crosslight 4 continues its innovation by introducing a new barcode scanner service that will help developers integrate barcode scanning feature right into Crosslight apps. Built from the ground up, Crosslight Barcode Scanner Service will be able to support and scan almost any types of barcode in the world as it supports more over than 20+ types of barcode format. Nice! Explore more on Crosslight Barcode Scanner. Powerful and comprehensive logging is an invaluable part of an enterprise app. It allows you to perform data mining, gather information about your users, and analyze errors and crashes for your app, especially when your app reaches production phase. In this release, we’re bringing you Crosslight Logging Framework, which will change how you log information from your app. 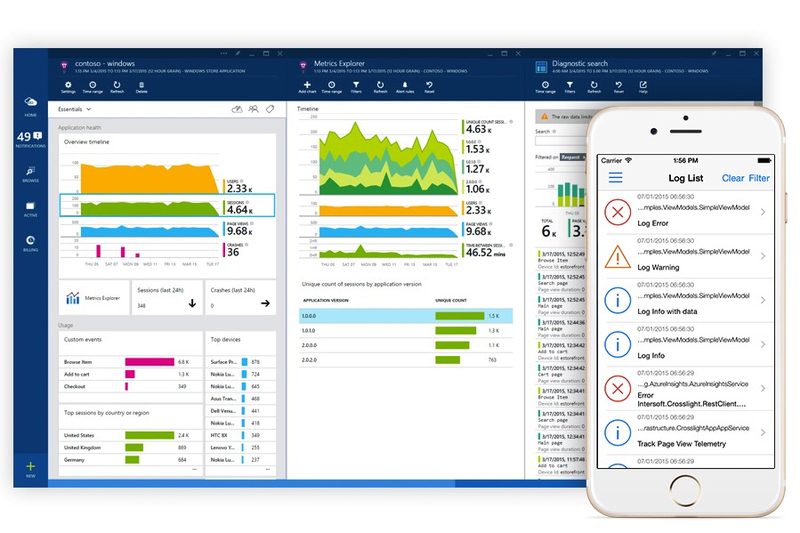 You can also easily log your apps to Azure Application Insights. Learn more. Crosslight Form Builder has been a favorite feature since it was first introduced in Crosslight 1. Crosslight developers have long enjoyed the simplicity of achieving tasks like form validation, data binding, form element placements and more using Crosslight Form Builder. In this release, the Crosslight Form Builder receives two new enhancements: interactive section visibility with animation and a new numeric stepper editor. The numeric stepper is the perfect editor for incrementing numeric values in small range, while the section visibility binding now allows you to show and hide sections at runtime, enabling more enterprise business scenarios. Learn more. Good news for iOS developers! 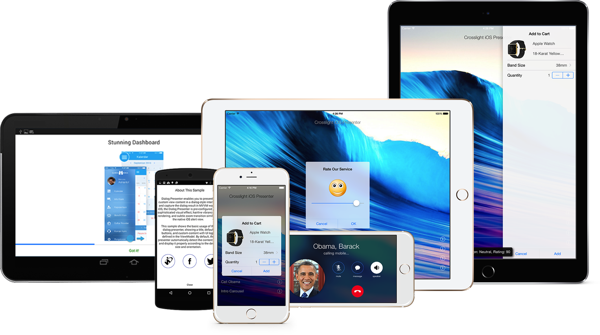 Crosslight 4 release marks an important milestone for iOS development specifically the addition for universal storyboards and Xamarin iOS designer support. 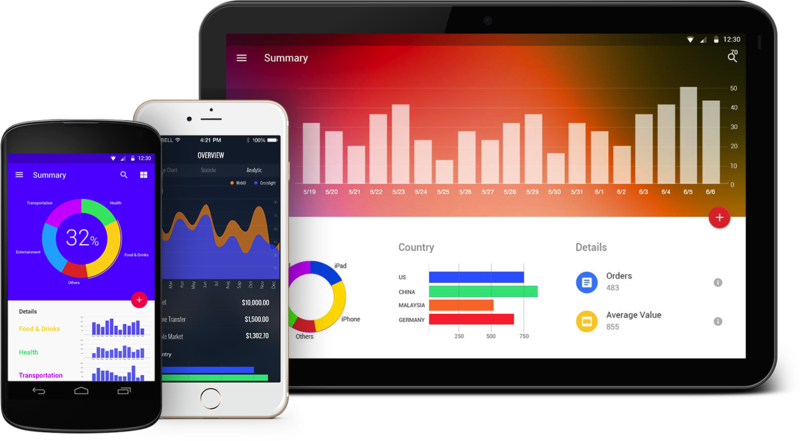 It also added sophisticated data visualization library and a lots of beautiful UI components that will surely elevate your iOS apps to the next level, such as scale and slide drawer animations, segmented bar controller, gorgeous rounded button and more. See what’s new in Crosslight iOS. Not only iOS but we bring good news for Android developers too. 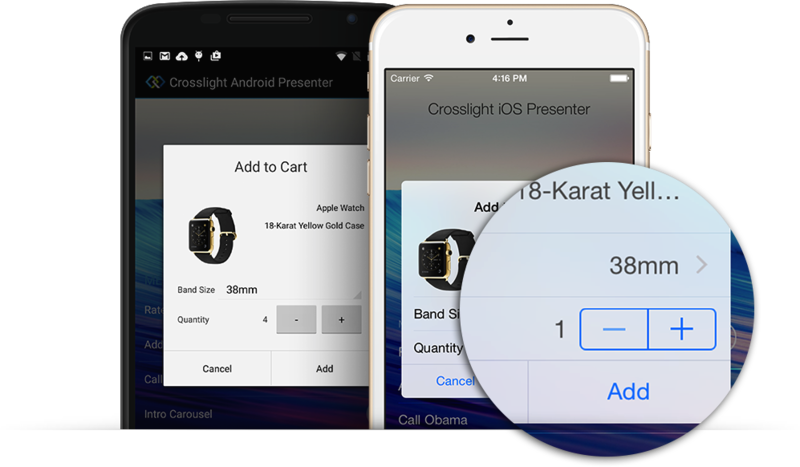 Crosslight 4 gives great enhancements to Android which will make mobile development even easier, such as new rounded button, new numeric stepper control, fused location provider, add binding support, ListView improvement in FormBuilder and many more. 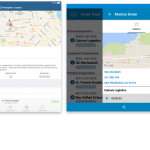 See what’s new in Crosslight Android. We have provided a comprehensive and powerful IDE and tooling support that is compatible with Visual Studio or Xamarin Studio, such as Crosslight Project Wizard, numerous item templates and project templates. All of these supports have truly helped developers to write, build, debug test and deploy their apps on devices. 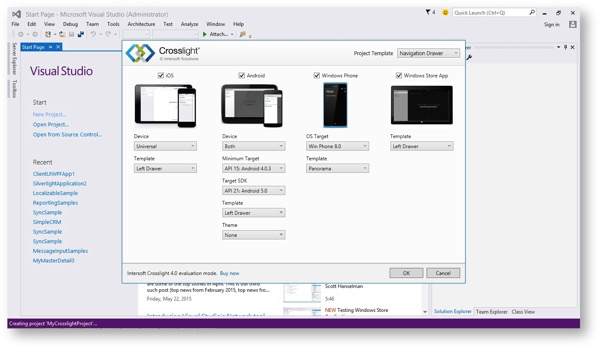 Crosslight 4 continues to enhance with even improved IDE and tooling support: iOS universal storyboard, Xamarin iOS designer, Visual Studio 2015 support and Visual Studio 2015 Android Emulator support. Learn more. Along with the new operating system, Windows 10, Microsoft has announced the RTM availability of the .NET developers’ favorite IDE, the Visual Studio 2015. The new IDE brings many exciting features to the table such as custom windows layouts, a better JustCode code editor with Roslyn support, shared project, IntelliSense support for XAML, Bower and NPM, and much more. Alongside these new features, developers can also enjoy accelerated development time with Intersoft Solutions’ award-winning toolset. The WebUI and ClientUI product lineup have been upgraded to fully support the design-time capabilities of the new IDE. Developers can enjoy the pure simplicity of drag-and-drop features when interacting with the designer tool. Crosslight developers can now enjoy the same, great development experience while working with Crosslight projects using the enhanced Project Wizard and templates that work wonderfully in Visual Studio 2015. With the announcement of public availability of Windows 10 on 29th July, 2015, we are dedicated to bringing full support to its product lineups from day 1. 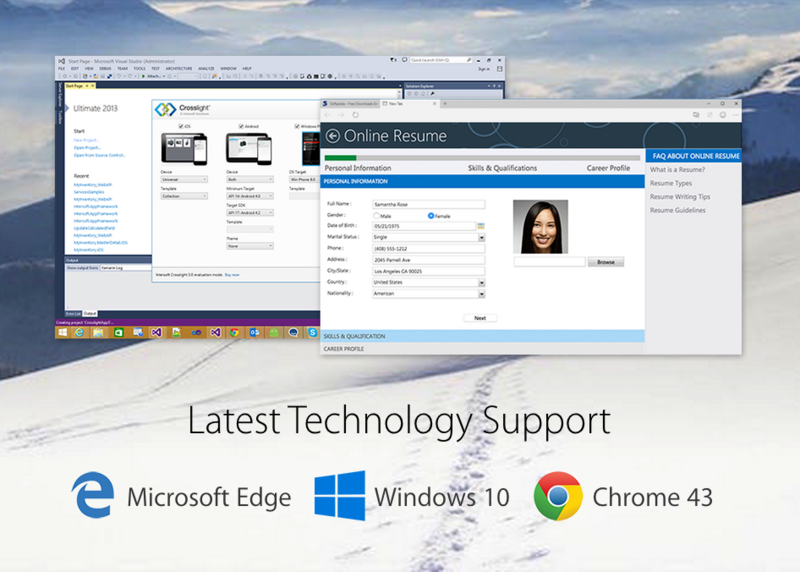 The entire WebUI suite is now enhanced to fully support the newest built-in Microsoft Edge web browser and renders in pixel-perfect retina display. In addition, ClientUI controls have also been tested to fully work in supported browsers running on top of Microsoft’s latest and greatest operating system. Furthermore, Crosslight has also been improved to support the latest operating system as well. Thanks to our team for their hard-work as we continue our enduring commitment to bringing great products that will significantly speed up development time on top of Microsoft’s revolutionary operating system. To discover the new features with better experiences, check out the 2015 Tour page.